How did this Battenburg Cake over at Zeb Bakes become this Vanilla Plum Trifle? Well as is happens, I had really strong intentions of giving the Batternburg a crack. I saw it, I had never heard of it, it, it looked tricky and I wanted to play. I thought the combination of vanilla and plum for the cakes would be nice. I also thought the vivid colour of my frozen summer plums would transcend in to the cake just a little more than it did. I also thought I had caster sugar. Result?… A cake that had raw sugar sticking out in it, and a rather murky plum cake colour that did not contrast at all with the vanilla side. What to do? Ditch it and eat the cake?… Or, as my mind went tickity tock. I thought Plum puree red and delicious…. vanilla mixed with a little mascarpone and dunk it all in cake…. Done. The deal was sealed and Mr Battenburg will have to wait until another day. This was given a 10/10 from Mr Chocolate, and he NEVVVERRR gives 10/10. It didn’t even have chocolate in it. In bowl place chopped up pieces of cake, and then drizzle some of the plum puree over the cake. Whisk together the mascarpone, icing sugar and vanilla. In between the cake and plum puree, dab spoonfuls of the mascarpone mixture. 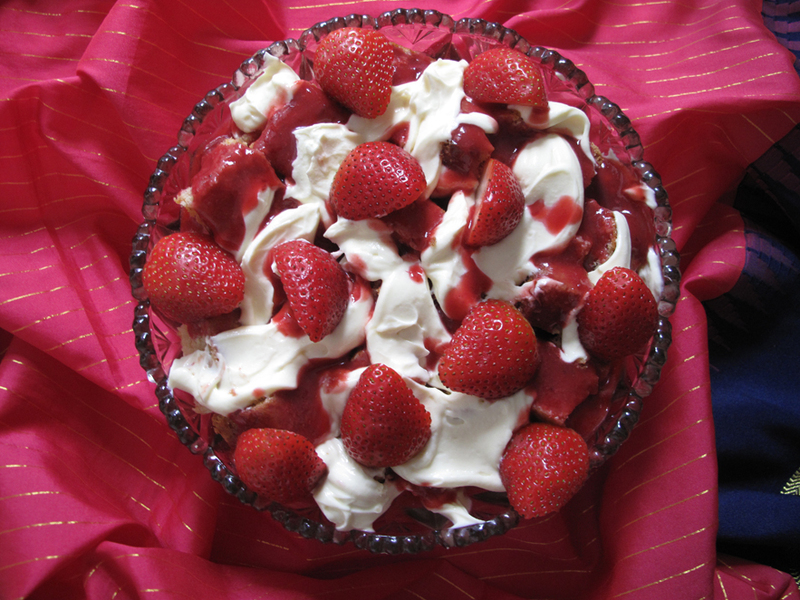 Keep laying the three componants until all used up and then place strawberries on top to fill in any gaps. Let sit in the fridge for a few hours to infuse the flavours. cook in lined baking tray at 180 C until golden. This entry was posted in Food Glorious Food and tagged dessert, plums, recipes, seasonal plums, trifle, vanilla cake, Vanilla Plum Trifle by cityhippyfarmgirl. Bookmark the permalink. Thanks Yvette. The tickety tocks don’t happen that often so have to run with it while I can! Glamour personified here! What a beautiful dessert – I love it, who needs battenburg when you can create something like this – WOW! and thanks for the pingback too! Your more than welcome Joanna 🙂 I still want to give the Battenburg a go, but in the mean time the trifle went over well. Monkey Boy keeps asking for it again, but also likes to look at all your Battenburg cake pictures as well. This looks and sounds delish!! And what a fabulous rescue!! 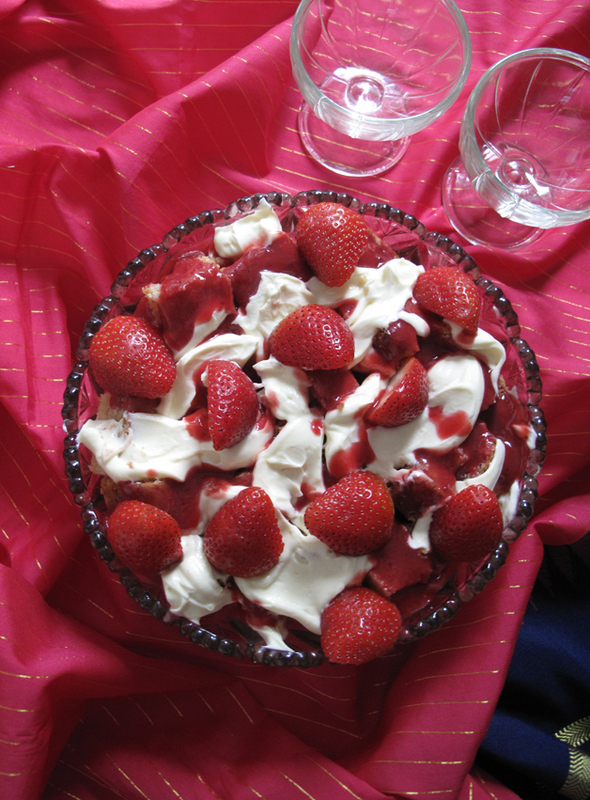 I hadn’t made trifle for years but it always was a favourite when I was a kid. Lots of coloured jelly and custard! Not good to show a pregnant woman something that delicious and not expect me to be drooling all over the computer! Me too- everything gets turned into something else. My frugal grandmother beams with pride. Although I usually put some spirits into mine. I’d add perhaps a little sherry. Oh, so much better than a battenburg!